I wasn’t sure if I would like dinner tonight or not ~ in all honesty, I am not sure if I liked curry or not. When I was little my sister told me if I ate curry it would make me stink so I have always avoided it….Is that true anyway?! You know because everything your sis tells you is, right? 😀 LOL. Tonight’s dinner actually did smell fantastic and I couldn’t wait to dig in. I started off with another new 0 Weight Watcher Point soup Cauliflower Soup. I used Brocco-Flower (the cauliflower is GREEN) so it made my soup look like split pea soup. Add all the veggies to a big soup pan and cover with broth. Bring to a boil and reduce heat to medium simmering for about 25 minutes. Remove from heat and let cool for about 10 minutes. 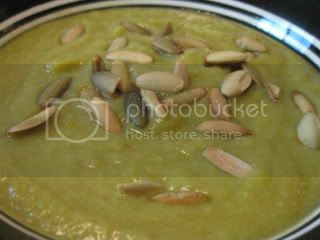 Once cool, blend, dish it up and top it with pumpkin seeds. Makes 4 servings. This soup smelled and tasted to me exactly like Top Ramen ~ you know the cheapo instant noodles in packs you used to eat as kids but wouldn’t think of eating now 🙂 I really was surprised that it didn’t taste like cauliflower or cabbage at all. 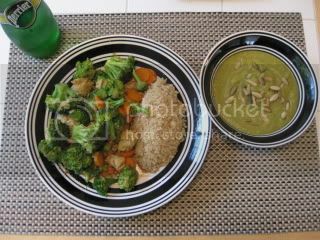 One Bikini Boot Camp lesson I’ve learned about me ~ you can add nuts to anything and I’ll eat it. I am amazed how much flavor just a small sprinkle of nuts gives things. While the soup cook, I prepped my next indian flare meal ~ Chicken Curry over Whole Wheat Couscous. 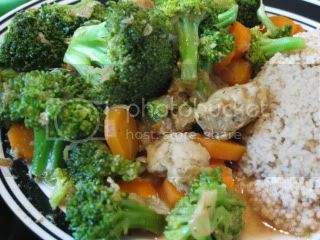 Heat oil in a stir fry or nonstick pan over medium heat. Add the onion, garlic, ginger, curry, 21 salute season and brown sugar. Cook for about 2-3 minutes or until the onion is soft. Add in the chicken and continue cooking 5-7 minutes or until the chicken is done. Add your veggies with 1 c of water reduce heat and cook for about 10-15 minutes until the veggies are tender and sauce remains. Makes 1 gigantic 7 Weight Watcher Point serving. I really enjoyed this dinner and believe it or not, curry is pretty darn tasty to me. I LOVE the fragrant smell it has when you cook and the spicy kick it gives to you food. The brown sugar added a hint of sweetness to go with the salt. Here was my super tasty, vegged out meal. This is why I LOVE stir-fry’s – you get a ton for hardly any calories/points. Our fridge is coming tomorrow morning ~ Yahoooooo!!! I am sooo excited, I can’t wait. The Husband and I ran around tonight getting a water line set up so we can use the built (inside the fridge) water dispenser and of course ice cubes. I will be sure to take lots of pictures to share – yeah! Alright ~ off to catch up on comments and a few blogs before I hit the hay! i love curry too 🙂 Yay for the new fridge! I have never tried curry before, but this sounds amazing!! Thanks for sharing! I like cauliflower and really want to try cauliflower mash. Have you ever tried it? What a great soup!! I've never had a 'real' curry before but it sounds fantastic! 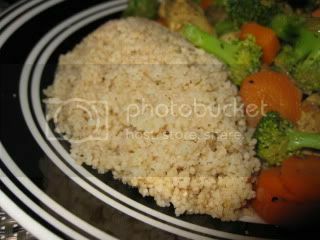 mmm i love couscous! i just bought a new container. believe it or not i love top ramen, but not all the sodium it packs.. it hink one serving is like over my daily sodium intake! so maybe this soup would be delicious to me! oh my mom started reading your blog and loves it! HOORAY FOR THE FRIDGE! I expect some major pictures when it arrives. That soup sounds really good. I love seeds and nuts! Olga ~ Ahhh thanks! Glad I made your bookmark list 🙂 I can't wait to hear what you think when you try it. Brandi ~ I was surprised I liked it! yeah for new spices! Theangrydieter ~ Love that name LOL….It's a fun dish to try curry out on. Kristi ~ I have heard of the cauliflower mash but haven't yet tried it. I wonder why that is – I need ot make it a point to do that! K ~ You are too cute – what kind of "curry" have you had then? Janetha ~ I LOVE top ramen too but then again I LOVE all pasta pretty much! You would like this recipe – it would've been perfect for when you had your tonsils out. Yeah for your mom reading too – hiya J's mom! Health ~ I don't know if it does or not but I covered myself up in extra "orange" spray this morning LOL….Of course, pictures are a must! C.G. ~ Nuts on soup is my new favorite thing!